The General Assembly of 2005 adopted the Venus Flytrap (Dionaea muscipula) as the official State Carnivorous Plant (Session Laws, 2005, c. 74). The bill to elect the Venus Fly Trap was proposed by the students of North Stanly High School in Stanly County, and was sponsored by Senator William Purcell of Scotland County. The logic behind the bill was that if North Carolina had a state flower and bird, it should also have a state plant. Still sore from the recent debate over South Carolina’s adoption of the Shag for their official dance, North Carolina legislators joked that they needed to adopt the Venus Flytrap as a symbol before South Carolina steals it. The Senate supported the bill with a vote of 47 to 1. The Venus flytrap is the only known plant that moves to entrap its prey. Though it is known and cultivated throughout the world, it is native only to a small area of the Coastal Plain in North and South Carolina (mostly within a 75 mile radius around Wilmington). The sandy, mineral-low soil of this region is why the plant is carnivorous, as insects provide Flytraps with nitrogen, phosphorus, and other essential nutrients. Despite its name, the Venus Flytrap does not usually eat flies, but rather other crawling insects that are drawn to it such as beetles or ants. The trap is activated when an insect (or other object) brushes 2 or more times against bristles that grow on the surface of the leaf. The trap springs shut in less than a second, but doesn't close completely until it has determined (either chemically or through movement) if it has caught worthwhile food. If it has, the trap gradually seals completely shut, allowing digestion to take place. It reopens in 3 days to 2 weeks. It is illegal in North Carolina to take Venus Flytraps from public land or from private property without permission. Violations of this can result in fines of $100 to $500. AN ACT TO ADOPT THE VENUS FLYTRAP AS THE OFFICIAL CARNIVOROUS PLANT OF THE STATE OF NORTH CAROLINA. "§ 145-22. State carnivorous plant. The Venus flytrap (Dionaea muscipula) is adopted as the official carnivorous plant of the State of North Carolina." In the General Assembly read three times and ratified this the 1st day of June, 2005. Schreiner, Mark. 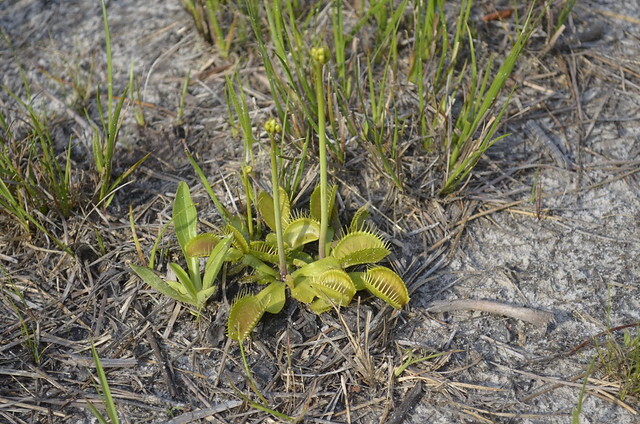 "Local plant might trap N.C. honor - Proposed legislation would give Venus' flytrap state title," Star-News (Wilmington, NC), February 13, 2005: 1B, 7B. Venus Flytraps, from the NCpedia Flickr photostream. Various photogrophers. Visit the NCpedia Flickr for credits and more information. https://www.flickr.com/photos/ncpedia/sets/72157626515143763/ (accessed May 17, 2016). Why is it legal to get one without perdition? The Venus Flytrap is native to North Carolina's coastal plain, but you also can find them at botanical gardens (including the North Carolina Botanical Garden in Chapel Hill: http://ncbg.unc.edu/).